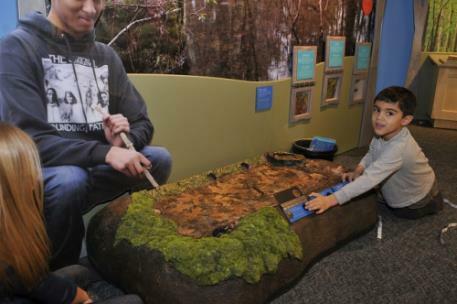 Creative Discovery Museum’s spring traveling exhibit, Native Voices, New England Tribal Families, opens to the public on Saturday through May 12. By visiting five different communities from northern to southern New England, museum visitors explore Native American traditions and how modern families balance contemporary life with preservation of important cultural identities. In conjunction with the Native Voices exhibit, the Museum will present Living Traditions: Southeastern Native American Art featuring the work of Southeastern Native American artists. The Museum will also offer extensive educational programs, events and artists in residences with Native American artists. Created by Boston Children’s Museum and sponsored nationally by the National Endowment for the Humanities and Ocean Spray, Native Voices features hands-on activities, immersive environments and Native American artifacts, both old and new. "The exhibit provides a great way to learn about how all cultures preserve important values and hand them down from one generation to the next," officials said. "Native Voices takes us through four New England seasons and shares stories, songs and cultural materials that illustrate strong and enduring connections between tribes and their traditional homelands." Visitors will meet members of the Passamaquoddy and Penobscot of Maine, the Narragansett of Rhode Island and the Aquinnah Wampanoag and Mashpee Wampanoag of Massachusetts through a series of environments and activities. Visitors can toboggan down a hill in Maine with young members of the Penobscot tribe, practice beading in an artist's studio on Cape Cod, meet students in a classroom at the Nuweetooun Tribal School in Rhode Island, explore a cranberry bog and the Aquinnah Tribal Museum on Martha's Vineyard and journey to Pow Wows across the United States and Canada. "Taking us far beyond the usual tales of the 'people who met the Pilgrims,' this hands-on exploration introduces five thriving New England communities as they work to balance cultural traditions with life in a modern world," officials said. "Part of BCM’s stunning collection of cultural materials from New England tribes is highlighted in the exhibition. The dynamic contrast between old and new – traditional beading on deer skin compared with an elaborately beaded pair of Keds sneakers is part of the charm of this exhibition." "Living Traditions, developed by Creative Discovery Museum, complements the Native Voices exhibit and shows the diversity, commonalities and differences of traditional crafts of five Southeastern tribes: Cherokee, Chickasaw, Choctaw, Creek and Seminole. Visitors will view a wide variety of basketry, beadwork, ceramics and textile work and learn about the importance of the living arts traditions from contemporary Native American artists whose craft has been taught to them by mentors and/or family members," officials said. To celebrate the exhibit opening, the Museum will host a Native Voices Event Day Saturday, Jan. 19 from noon-4 p.m. In addition to exploring the new exhibit, guests will have the opportunity to interact with and learn more about traditional art forms of the Eastern Band of Cherokee Indians. Mary Thompson will give a pottery demonstration and Alva Crowe will do a flute performance and blow gun demonstration. The Museum is also hosting artists-in-residences and other performances throughout the exhibit’s stay in Chattanooga. Native Voices: New England Tribal Families was created by Boston Children’s Museum in collaboration with a distinguished Native American advisory board of tribal members, historians and academics. Native Voices is sponsored locally by The Lyndhurst Foundation and Novatech.